The mountain city of Baguio in the Philippines has long been known as the country's Summer Capital. Generations of visitors make the long trek to Baguio from Manila in the summer to escape the stifling heat of the lowland cities. It's not just the soothing climate, though, that draws the tourists in. Great food? Panoramic landscapes? Good accommodations? Check, check, and check. The Panagbenga Festival beats them all as Baguio's top attraction. This so-called “flower festival” was first held in the early 90s to lift the people’s spirits after a devastating earthquake. The ensuing festival was so successful, they brought it back the year afterward, and the year after that… and never stopped. Over time, the festival format evolved and expanded to cover an entire month's worth of festivities. The event now promotes commerce and cultural development for both Baguio and the surrounding areas. While 2019’s Panagbenga officially begins on February 1, the real crowd draws happen between March 2 to 10, beginning with two back-to-back parades down Baguio’s main streets. Two parades represent the Panagbenga festival's main event, held towards the end of the month-long celebration period. The word "Panagbenga" literally means "season of blooming", so expect to see floats liberally decorated with blossoms, like those you’d find in Pasadena’s Rose Parade (the scale is smaller of course, due to Baguio’s tight streets). The Grand Street Dance Parade takes place on March 2 – costumed revelers and lively dancers also weave their way down the parade route, with marching bands heralding the parade’s presence. The dance groups compete for cash prizes of PHP 250,000 (about US$ 4,730). The Grand Float Parade happens the next day, on March 3 – expect to see about two dozen flower-covered floats going down Baguio’s main streets, sponsored by Philippines companies and local Baguio organizations. The parades take different routes; the Grand Street Dance Parade route starts at Panagbenga Park and ends at Baguio Athletic Bowl near Burnham Park; the Grand Float Parade starts at DILG on Upper Session Road and ends at the Melvin Jones Football Grounds. 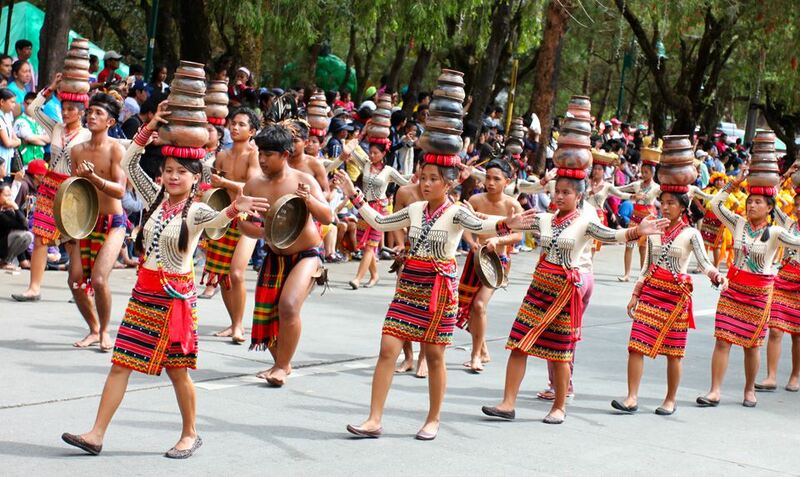 Baguio’s Session Road will be closed to motorized traffic for a week after the Parades. Cars will give way to artisans and entrepreneurs from Baguio and the surrounding territories, who display their products on stalls along the street. The souvenir shopping scene here draws from the best of the Philippines, ranging from special foods and custom clothing to gadgets and novelty items. This is a great time and place to wander down Session Road at your leisure, stopping by once in a while to try some Filipino food – even the scary-looking balut! Some stalls will let you haggle the price down – but do it only for fun. Some of the vendors carry their wares from far-away provinces to get to Panagbenga, and you’ll want them to earn a tidy profit at the end of the day! The “pony boys” are a Baguio institution – Wright Park in Baguio (location on Google Maps) hosts dozens of horses that offer scenic rides to tourists, with each horse guided by a pony boy down a set route. On March 9, the pony boys get a day on Panagbenga’s festive calendar to show off their riding skills. Ranchers, riders, and other equine professionals troop in from all around to join in the day’s competitions – including barrel races, flag and barrel relays, and other tests of skill and speed. The fun all takes place on the Pony Boys’ home turf, Wright Park. Spectators can come and watch – but not join – the festivities. On the evening of March 10, Panagbenga officially closes with ceremonies at the Baguio Athletic Bowl near Burnham Park. But you don’t have to troop there to celebrate the festival’s closing in style. Fireworks will go off throughout the evening, launching from five stations throughout the city to give most visitors a ringside view of the airborne spectacle, wherever they are in Baguio. With a whole month of celebrations planned, Panagbenga also offers many other activities flying below the radar. Throughout Panagbenga season, big name bands and celebrities share the spotlight with local talent in a rolling schedule of concerts and variety show events. Many of them are free, held in prominent locations like SM City Baguio (though there’s still a charge for the best seats, usually bought in advance). Local organizations also host special events like paintball tournaments and art competitions, as both fundraisers and to promote their cause. The actual events change from year to year, but a full schedule is usually provided by the Panagbenga organizers. Most hotels display the schedules in their lobby. You can also visit the official Panagbenga website for details. Book transport & accommodations early. Panagbenga is Baguio’s biggest event, and the weekend before the big parade sees a massive influx of visitors from nearby provinces and from Manila. Try to book in the first few weeks of January, before you get crowded out. Get seats on Philippines bus booking sites (PHbus.com|pinoytravel.com.ph|biyaheroes.com). For accommodations, compare rates on Baguio City hotels in the Philippines. Check the weather a few days before your trip so you know what to pack. While Baguio weather in the “dry” months tends to be pleasantly crisp, the local climate has a capacity for surprise showers. Read about weather in the Philippines. Prepare to walk everywhere. Baguio will be crowded, and city transportation hard to find. Arrive early to get a prime Parade viewing spot. The parade route will be packed for both Parade days; some viewers arrive before dawn to secure a prime seat. Set aside a few extra days to explore. From Baguio, the Banaue Rice Terraces and Sagada are just a few hours away by bus. With a “New Wonder of the World” so close by, why not check it out? Read about other places to visit in the Philippines, and a two-week itinerary of the country.